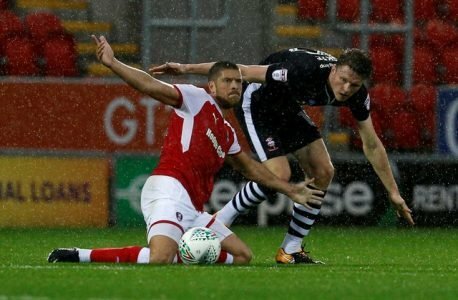 Rotherham United striker Jamie Proctor has been told by his Manager Paul Warne that he will lead the team out at Wembley. The twenty-six year old joined the Millers last summer but after being stretchered from the pitch in a game against Charlton Athletic in August he had to have surgery on a damaged Achilles Cruciate Ligament meaning he hasn’t kicked a ball since. But the Millers Boss told Leon Wobschall of The Yorkshire Post that he will let Jamie lead the team out saying, ‘It will give him a boost which he deserves. ‘He’s had an horrendous season and it is testament to how the lad is and how professional he has been this season. His attitude around the place has been great. He comes to the changing rooms before games and texts me ‘good luck’ before games and is in there every morning at seven o’clock with the staff in the gym. Lovely gesture from the Millers. Having Procts back next season fit and well will be like having a brand new player in the squad.